Start off your visit on the 26th (Fri): admire the masterpieces at Rijksmuseum, then take a stroll through The Jordaan, and then get engrossed in the history at Anne Frank House. On the 27th (Sat), you'll have a packed day of sightseeing: explore the world behind art at Van Gogh Museum, then admire the masterpieces at Willet-Holthuysen Museum, then take an in-depth tour of The Resistance Museum (Amsterdams Verzetsmuseum), and finally explore the world behind art at Museum Het Rembrandthuis (Rembrandt House). For where to stay, other places to visit, traveler tips, and other tourist information, you can read our Amsterdam trip planner . Los Angeles, USA to Amsterdam is an approximately 13.5-hour flight. You can also do a combination of flight and train. The time zone difference moving from Pacific Standard Time (PST) to Central European Time (CET) is 9 hours. In April, Amsterdam is slightly colder than Los Angeles - with highs of 56°F and lows of 40°F. Finish up your sightseeing early on the 27th (Sat) so you can travel to Budapest. Start off your visit on the 28th (Sun): admire the landmark architecture of Dohány Street Synagogue, appreciate the history behind Hősök tere, then examine the collection at House of Terror Museum, then steep yourself in history at Matthias Church, and finally make a trip to Fisherman's Bastion. On the 29th (Mon), you'll have a packed day of sightseeing: don't miss a visit to Shoes on the Danube Bank, get a taste of the local shopping with Koller Gallery, take in the spiritual surroundings of St. Stephen's Basilica (Szent Istvan Bazilika), then explore the historical opulence of Vajdahunyad Castle (Vajdahunyadvar), and finally don't miss a visit to Andrassy Avenue. For reviews, other places to visit, traveler tips, and other tourist information, go to the Budapest tour itinerary planner . You can fly from Amsterdam to Budapest in 5 hours. Alternatively, you can do a combination of train and flight; or drive. When traveling from Amsterdam in April, plan for a bit warmer days and about the same nights in Budapest: temperatures range from 63°F by day to 40°F at night. Wrap up your sightseeing on the 29th (Mon) to allow time to travel to Istanbul. Let the collections at Hagia Sophia Museum / Church (Ayasofya) and Topkapi Palace capture your imagination. Satisfy your inner culture vulture at Sultan Ahmed Mosque and Istanbul Modern Museum. The adventure continues: admire the masterpieces at Kariye Museum (The Chora Church), see the interesting displays at Rahmi M. Koc Museum, contemplate in the serene atmosphere at Suleymaniye Cami , and enjoy breathtaking views from Galata Tower. To see reviews, where to stay, maps, and tourist information, read Istanbul trip itinerary planner. You can fly from Budapest to Istanbul in 6 hours. Alternatively, you can do a combination of flight and shuttle; or drive. The time zone changes from Central European Time to Eastern European Time, which is usually a 2 hour difference. Plan for a bit warmer nights when traveling from Budapest in April since evenings lows in Istanbul dip to 46°F. Wrap up your sightseeing on the 2nd (Thu) to allow time to travel to Venice. 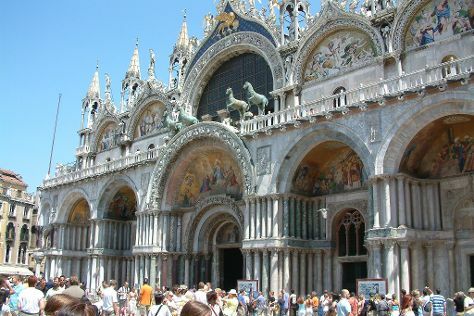 On the 3rd (Fri), contemplate the long history of St Mark's Campanile, admire the striking features of Basilica di San Marco, then make a trip to St. Mark's Square, and finally admire the striking features of Doge's Palace. Keep things going the next day: take in the architecture and atmosphere at San Giorgio Maggiore, make a trip to Peggy Guggenheim Collection, then take in the views from Ponte di Rialto, and finally explore the activities along Canal Grande. For traveler tips, ratings, and more tourist information, go to the Venice attractions planner . Fly from Istanbul to Venice in 5.5 hours. Alternatively, you can do a combination of flight and train; or drive. You'll gain 2 hours traveling from Istanbul to Venice due to the time zone difference. Expect a daytime high around 72°F in May, and nighttime lows around 55°F. Finish your sightseeing early on the 4th (Sat) to allow enough time to take a train to Florence. Kick off your visit on the 5th (Sun): explore the world behind art at Uffizi Galleries, then take in the spiritual surroundings of The Baptistery of St. John, then take an in-depth tour of Basilica di Santa Croce, and finally examine the collection at Galleria dell'Accademia. Here are some ideas for day two: admire the masterpieces at Pitti Palace, take some stellar pictures from Piazzale Michelangelo, take in the architecture and atmosphere at Cathedral of Santa Maria del Fiore, then enjoy breathtaking views from Campanile di Giotto, and finally appreciate the extensive heritage of Piazza del Duomo. To find more things to do, where to stay, ratings, and more tourist information, use the Florence road trip app . Traveling by train from Venice to Florence takes 2.5 hours. Alternatively, you can drive; or take a bus. In May, plan for daily highs up to 71°F, and evening lows to 52°F. Wrap up your sightseeing on the 6th (Mon) early enough to take a train to Rome. Get a sense of the local culture at Vatican Museums and Palatine Hill. Visit St. Peter's Basilica and Piazza Navona for their historical value. The adventure continues: steep yourself in history at Colosseum, delve into the mystery of Catacombe di San Callisto, admire the local landmark of Trevi Fountain, and don't miss a visit to Roman Forum. Plan trip to Rome with our itinerary maker to find out where to go and what to do. You can take a train from Florence to Rome in 2 hours. Other options are to drive; or fly. Traveling from Florence in May, you can expect nighttime temperatures to be a bit warmer in Rome, with lows of 58°F. Wrap up your sightseeing on the 9th (Thu) to allow time to travel to Lisbon. Start off your visit on the 10th (Fri): contemplate in the serene atmosphere at Jeronimos Monastery, then take a stroll through Belém Tower, then take a stroll through Avenida da Liberdade, and finally step into the grandiose world of Castelo de S. Jorge. Keep things going the next day: wander the streets of Alfama, then admire the masterpieces at National Tile Museum, and then view the masterpieces at Museu Calouste Gulbenkian. To see more things to do, photos, ratings, and other tourist information, go to the Lisbon trip site . Do a combination of train and flight from Rome to Lisbon in 6 hours. Alternatively, you can fly; or drive. Due to the time zone difference, you'll gain 1 hour traveling from Rome to Lisbon. Expect a daytime high around 75°F in May, and nighttime lows around 55°F. Wrap up your sightseeing on the 11th (Sat) early enough to travel to Paris. 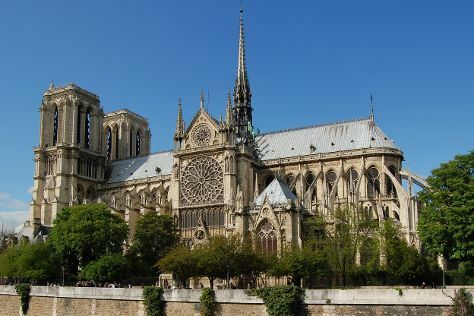 Do some cultural sightseeing at Le Marais and Cathédrale Notre-Dame de Paris. Let the collections at Musee d'Orsay and Louvre Museum capture your imagination. Next up on the itinerary: admire the landmark architecture of Basilique du Sacre-Coeur de Montmartre, wander the streets of Saint Germain des Pres Quarter, don't miss a visit to Champs-Elysees, and pause for some photo ops at Arc de Triomphe. For more things to do, traveler tips, where to stay, and other tourist information, go to the Paris trip planning website . Traveling by combination of flight, bus, and train from Lisbon to Paris takes 5.5 hours. Alternatively, you can fly; or drive. The time zone difference moving from Western European Time (WET) to Central European Time (CET) is 1 hour. Plan for slightly colder temperatures traveling from Lisbon in May, with highs in Paris at 64°F and lows at 49°F. Finish your sightseeing early on the 14th (Tue) to allow enough time to travel back home.